San's Umdloti - Umdloti Beach Accommodation. 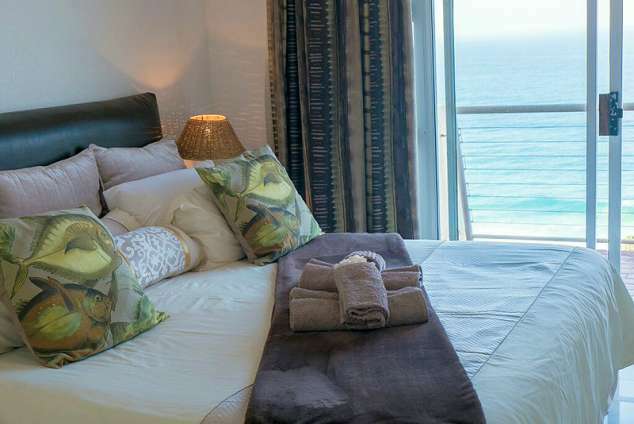 San's Place offers an air-conditioned, en suite bedroom ( bath, toilet, washbasin and separate shower) , a fully equipped kitchen, complete with washing machine, and a large lounge with DStv and DVD. The lounge and bedroom have sliding doors that lead out to a covered patio with truly exceptional 180 degree sea views. Dolphin-viewing and whale-watching can be done from the comfort of your easy chair on the patio, which has its own Weber Braai. An undercover parking bay is situated right outside the apartment. The complex in which San's Place is located, Cascades, boasts a swimming pool, squash court and gymnasium. 24 hour security is provided. Please note that the apartment is not suitable for bookings of paties larger than two. Umdloti has numerous excellent restaurants and the nearby ( 2 min drive ) swimming beach is a snorkler's paradise. We provide beach chairs and an umbrella. Nearby attractions include Gateway Entertainment and Shopping Centre ( 8 km ) and the Sibaya Casino and Restaurant Complex ( 3 km ). The bustling malls and facilities of Umhlanga Rocks and Ballito are a short drive away. Take the N2 following the signs to Stanger. At Umdloti off-ramp turn right onto the road that leads into Umdloti. After about 1km, turn left into Bellamont Road. At the T junction turn right and Cascades is 200 metres on your left hand side. From Durban : Take the M4 past Umhlanga Rocks and follow directions as above. Take the N2 following the North Coast Signs Take Umhlanga off ramp. Turn right over high way continue and drive under Millennium bridge. Take next off ramp left and turn left onto Umhlanga Rocks Drive. Keep left Pass Umhlanga hospital and Sharks Board on left. This road is called Herwood Drive. Continue for about 1 Km until you get to a road called Campbell Drive. 82494 page views since 20 Feb, 2008.